If God determined when and where I live, then when the people He’s placed around me start looking for truth, I’d like to think that if I’ve done my part beforehand, they will be more likely to want to hear from me. That’s why I hosted a “Community Pancake Breakfast” for the people in the apartment building I occupy, and boy did we have a good time! About ten neighbors came over and hung out in the second floor hallway of our complex, and everyone brought something to share. The cool thing is simply this: I got to invest a tiny bit in the people around me (I didn’t have to buy the pancake mix as it was a gift to me), but that investment has enormous potential to bring a Gospel payoff in the future. What about you? Have you done something like this before? If you have, I’d love to hear about it! Please post in the comments section further down the page. 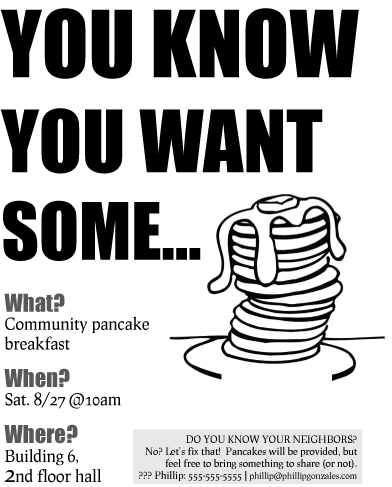 If you haven’t, but would like to, I’d be happy to modify THIS FLYER for you to post around your neighborhood. Then, tell me how it went! Be blessed friends, and may you find more and more creative ways to BE a blessing, too.